At the Bathurst Jewish Community Centre, past Sheppard Avenue in Toronto, Andrew Wiggins first played organized basketball. It was September, 2004, and Andrew was nine and already 5-foot-7. After he practised once with his under-10 novice team in the Ontario Basketball Association, the coach Arie Mazur called a friend, Phil Dixon, a Toronto basketball phenom from a generation earlier. Mazur brashly predicted the quiet, humble boy would, in a decade’s time, become a No. 1 NBA draft pick. “He had a grace about him,” Mazur says. Wiggins today is the face of an emerging basketball city. The arrival of Toronto, and Canada, on the sport’s global stage faces its greatest test yet as September begins. Wiggins and a cadre of young players, most born within a couple years of each other and raised in a span of 70 kilometres along Lake Ontario, aim to bring the national men’s team back to the Olympics for the first time in 16 years. A Canadian, James Naismith, invented the game in 1891 at a YMCA in Springfield, Mass. The sport was a hit and, when basketball debuted at the Olympics in Berlin in 1936, the United States defeated Canada 19-8 for gold on a rain-drenched outdoor court. Naismith, three years before he died, presented the medals. Basketball flourished in the U.S. but not in Canada. While the first game of the league that would become the NBA was played in Toronto in 1946 (the local Huskies losing to the New York Knickerbockers), Canada on the amateur level won no more Olympic medals after Berlin. In the past half-century, the country has qualified for the men’s tournament in only four of 12 Summer Games. Now comes its current squad, carrying high hopes – general manager Steve Nash and coach Jay Triano have proclaimed it the best Canadian basketball team ever assembled. Immigration from the Caribbean is an essential root to its makeup. Another is the arrival of the NBA in 1995, the year Wiggins was born. The showmanship of the Raptors’ Vince Carter in the early 2000s was a beacon, and British Columbia’s Nash was an icon. As teenagers, the national team members of today played for Canada internationally, and most spent their final years of high school at elite basketball prep schools, before college hoops there and onwards to the NBA. The FIBA Americas tournament, which begins Monday in Mexico City and concludes Sept. 12, will be a stiff test of how far they’ve come. On the plus side, Canada won a tuneup tournament in Puerto Rico this week, going undefeated in four games. The youth movement is in full force, promising fresh legs but also inexperience at the highest levels of international play. Wiggins is just 20 and point guard Cory Joseph is the veteran leader at 24. Another top Canadian, Tristan Thompson, won’t play, mired in an NBA contract dispute. Rivals include savvy teams such as Argentina, hardened in the international game. There will be eight games in nine days, after which 10 countries will be whittled to four. Should Canada, as expected, make it that far, it would face a must-win semifinal. The two finalists secure berths at the 2016 Olympics in Rio de Janeiro. If Canada qualifies, Nash believes the squad has an outside shot at a medal. While Nash knows his team’s strengths – rising stars and a deep bench, with two-thirds of the squad playing in the NBA – the leader of Canada’s last Olympic team recalls how daunting this challenge can be, physically demanding and with little margin for error. Three decades ago, there were flashes of Canada rising. In 1983, a squad of young Canadians, led by Triano, won gold at the World University Games in Edmonton. In the semifinal, Canada defeated a U.S. team featuring future NBA stars Charles Barkley and Karl Malone. The next year at the 1984 Olympics in Los Angeles, Canada lost the bronze-medal game to finish fourth, as it had in 1976 in Montreal. The last time something big felt possible was 2000 at the Sydney Olympics, where Nash, after four NBA seasons, began to ascend. The team, coached by Triano, was captained by Rowan Barrett. In a scrappy, stirring performance, Canada won its round-robin group – but lost in the quarterfinals to France, by five points, France going on to win silver. “Those things you never forget,” Barrett says. Three years later, the team failed to qualify for the 2004 Olympics in Athens. In defeat, Nash and Barrett made a pact: that eventually they would help lead Canada to basketball glory. A dozen years later, Barrett sits behind his desk in his small windowless office at the worn headquarters of Canada Basketball, on the edge of Toronto. He is assistant general manager of the men’s team. After a pro career overseas, he worked as a Royal Bank branch manager and got his MBA. The national men’s program was in tatters. Triano in 2004 had been fired, and Nash, a close friend of his, cut ties. 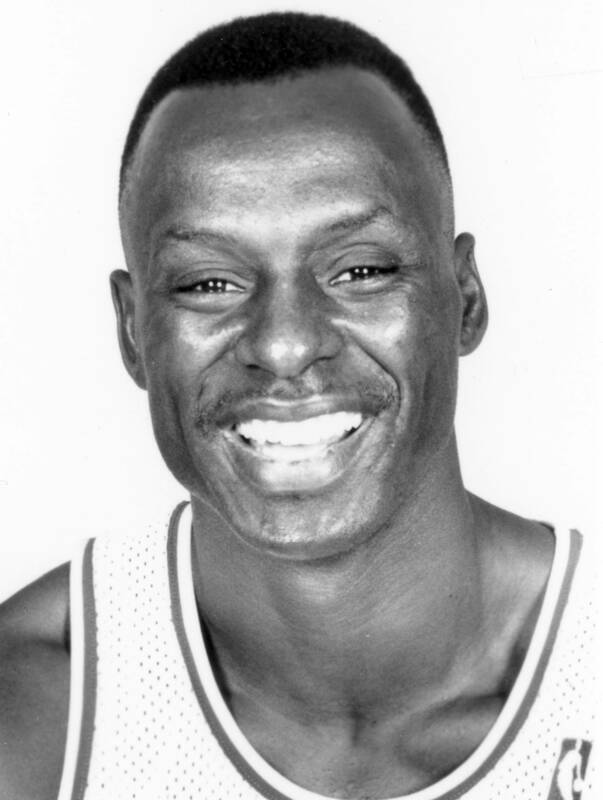 Mitchell Wiggins, Andrew’s father, played for the Houston Rockets in the 1980s. Barrett watched what was happening in Toronto, the boys coming up. He remembers Cory Joseph as a kid, on the sidelines dribbling and shooting when Barrett played pickup basketball with Joseph’s dad. He remembers watching Nik Stauskus play for Loyola Catholic Secondary in Mississauga. He remembers tutoring Wiggins on the court when Andrew was a young teen. “I know these kids,” Barrett says. In 2011, Barrett wanted to act. The timing wasn’t good for Nash, still an NBA star. But, Nash says, “I realized the immediacy.” Money was the big problem. Nash and Barrett knew the struggle of a threadbare national team. When the team flew to the Sydney Olympics, Nash, at 6-foot-3, had to take a middle seat. Meetings followed and Wayne Parrish, a media executive and head of Canada Basketball, outlined a plan to drum up dollars from corporate donors, Canadian executives such as David Kassie, John Bitove and George Cope. It worked. In 2012, Nash and Barrett signed on, and Triano returned as head coach. In early May that year, among Barrett’s first official duties, he flew to Dallas to see a 17-year-old Wiggins play in a tournament. The official work to build a team was on. In Barrett’s office, with a depth chart of dozens of players on one wall and a Canadian flag behind him, Barrett unfurls a three-metre-long laminated scroll, five years of international play broken into columns of advanced statistics. It’s a display of capacity Canada Basketball hasn’t had before. It’s also proprietary information – Barrett carefully tucks it away. The undercurrents of Canada’s resurgence in basketball first stirred in 1962. Jamaica gained its independence, as did Trinidad and Tobago. The United Kingdom tightened its immigration law, and Canada started to liberalize its rules. “It was a pivotal year,” says Valerie Knowles, author of Strangers at Our Gates, an immigration history of Canada. Barrett was born in Canada to Jamaican immigrant parents, and it was during his playing days that Toronto’s Caribbean ties first made an impact on the court. The influence has grown since then. The parents of today’s crop of players arrived when they were young: Wiggins’s mother, Marita Payne, from Barbados; David Joseph, Cory’s father, from Trinidad; Andrea Brooks, mother of Tristan Thompson, from Jamaica; Dwight Powell’s mother, Jacqueline Weir, from Jamaica. Andrew Nicholson’s family has Jamaican heritage, as does Tyler Ennis’s; Edith Bennett, mother of Anthony, the first No. 1 NBA draft pick from Canada in 2013, settled in Toronto after leaving Jamaica at 19. It was often a difficult move: working menial jobs, fighting for legal status, staking out a life in a foreign country. “It was really hard,” Edith Bennett says. The city and country were changing. Toronto, in the early 1970s, was predominately white, home to 2.6-million, smaller than such cities as Philadelphia, Detroit and San Francisco. In the 1990s, in five years, the Caribbean population jumped to 240,000 from about 80,000 as Toronto reached 4.2-million people, surpassing once-larger American cities. By 2014, the metropolis’s population, nearly half visible minorities, crested six million. Five per cent – roughly 300,000 – had Caribbean roots. Wiggins, whose mother Marita won two sprint-relay silver medals for Canada at the 1984 Los Angeles Olympics, and whose father Mitchell reached the NBA finals with the Houston Rockets in 1986, was a prodigy who moved to the U.S. when he was just 16, starting with two years at Huntington Prep in West Virginia. “Andrew was very serious about what type of player he wanted to become,” his father says. U.S. prep schools were an essential step for this generation, as junior hockey teams in Canada are for some young American and European players. Joseph, who had already been a two-time Ontario provincial champion at Pickering High School, moved south in 2008, winning a scholarship to powerhouse Findlay Prep near Las Vegas, where he was soon joined by Thompson. Bennett later followed. “It was the best thing for him,” says Connie Joseph of her son’s move, saying the academics at the school were as important as the basketball in qualifying for a top U.S. university. This is what separates the current Canadian men’s national squad, even with its senior-level inexperience, from teams of the past. The players have tested themselves against top-tier Americans for years, a foundation of the climb to the NBA. 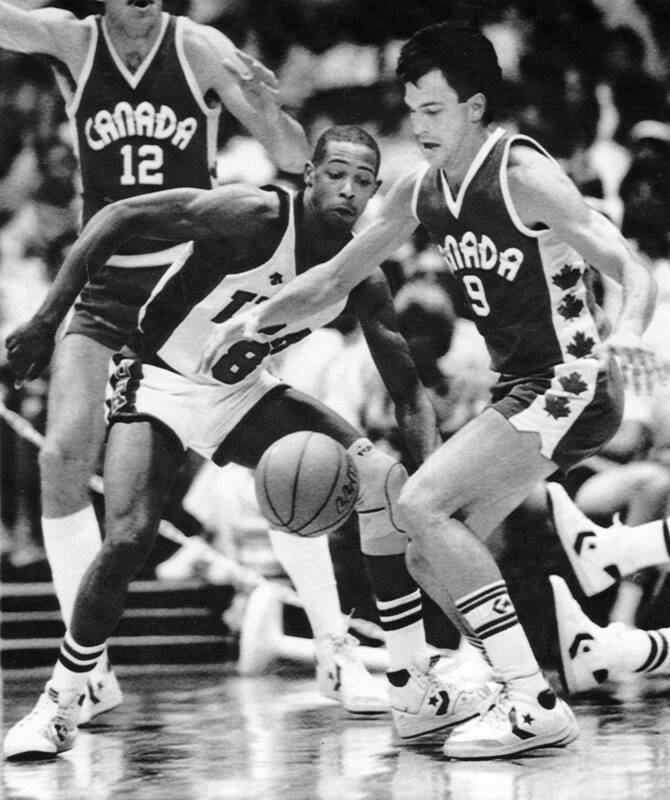 The 1984 team that came close to winning bronze had one player go on to the NBA. 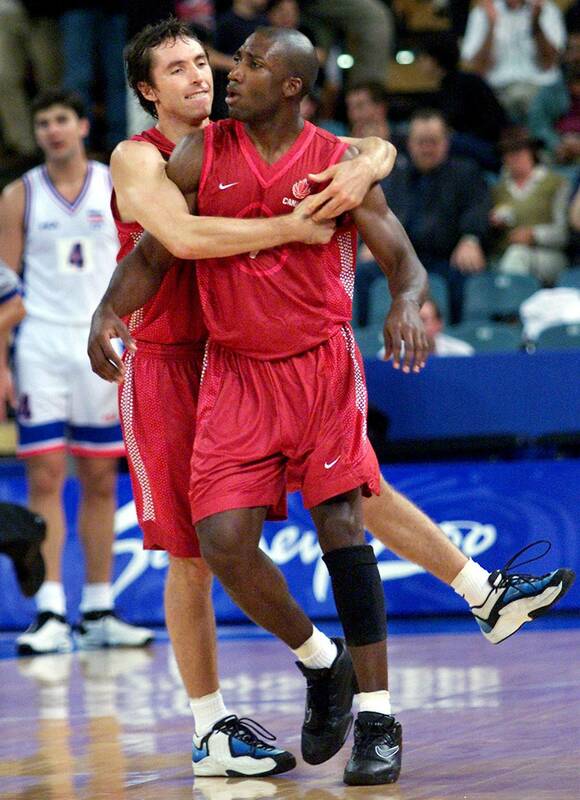 In 2000, Nash was one of two NBA players on the Olympic team. The intersections of the current generation stretch back several years. Among parents, Connie Joseph and Arlene Olynyk – mothers of two team leaders – played together on the women’s hoops squad at the University of Lethbridge. Their boys, Cory Joseph and Kelly Olynyk, were on a Scarborough Blues club team that rarely lost in the late 1990s and early 2000s. One defeat came against rival Toronto 5-0, led by Steph Curry, the NBA’s 2014-15 MVP. Curry was in Toronto as a kid for a couple years when his dad Dell played for the Raptors. The early experiences, says Ken Olynyk, Kelly’s father, forged a “very strong feeling of place” among the boys. The Falstaff Community Centre, off Jane Street up against Highway 401, was an essential gathering place. The gym is small, the court tightly hemmed in, the walls barely a metre outside its bounds. It was here, under the guidance of Ro Russell, that a bulk of Canada’s national team came through as teenagers: Joseph, Thompson, Powell, Wiggins, Stauskas, Brady Heslip (Jay Triano’s nephew). Joseph made the long trek from Pickering, east of the city. “Train, bus, hitch a ride, it didn’t matter, as long as I got there,” he says. “I don’t think any of us knew at that point what was in the making,” Stauskas says. The national squad has potential, but it remains in the category of what-might-be. Canada failed to qualify for basketball’s 2014 World Cup, after placing sixth in 2013 with Thompson and Joseph at FIBA Americas, the same tournament it returns to on Monday. The NBA has been a challenge, too. Bennett and Wiggins were back-to-back No. 1 picks, but Bennett’s play was poor and only recently has improved. Wiggins, the league’s near-unanimous rookie of the year in 2014-15, has been a standout. Thompson was a key contributor on the Cleveland team that lost to Golden State in this year’s finals. But the norm for young Canadians in the NBA has been struggle, and not a lot of time on the court. Triano is well aware of the potential and the pitfalls. The captain of the men’s national team for most of the 1980s, he sees a long-building wave. The only country to upend the U.S. since the Dream Team era began in 1992 was Argentina in 2004. If Canada’s golden generation is to rival Argentina’s, prime time is 2020 at the Olympics in Tokyo. But the mission to deliver on the promise begins in Mexico City.